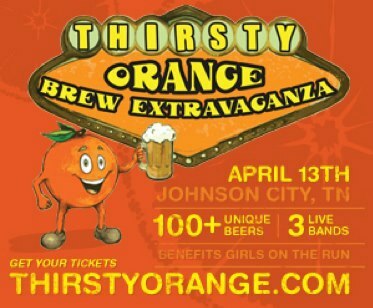 Last weekend was the Thirsty Orange beer festival in Johnson City, TN. This was the second annual edition, and festival organizers Aaron & Stephanie Carson and Das Krew did an absolute fantastic job of putting together this one. The weather was perfect, the beer was flowing and everything ran smoothly. From the early morning set up, to dropping off entries for the homebrew competition, to early admission VIP entrance, to the main part of the festival all the way to packing everything up, was all without a hitch. This is the 4th festival they have put on in the tri-cities area. They have learned from past festivals and had the logistics locked down for this one. I can’t say it enough how great and put together it was. I arrived Friday evening to spend some time meeting with Aaron and Stephanie to work out the details for running the infusers the next day. I always try to get to a beer festival in another city a day before to check out the area and most importantly to not have to make a long drive 1st thing in the morning. After meeting with Aaron and Stephanie, I ran to the store to get infuser ingredients and ended up eating at a crappy Mexican restaurant (seriously I LOVE Mexican food, but this one was awful). Saturday morning I was up early for the festival. Set up time started at 8:30. I had to set up the booth, get the beer flowing, fill bottles for the homebrew competition and so on. It took quite awhile to get everything done. Luckily I was all set up by the time early admission VIPs started trickling in. From there I stayed busy. So busy in fact that I didn’t really take a lot of pictures (my bad). I was busy but it wasn’t a hectic, frantic type of busy but a happy and sociable one. I got to talk, hang out and drink with many of our pro-brewer buddies such as Studio Brew and CalfKiller. My tent was set up in the home brewer section of the festival right next to my good friend Jimie Barnett and Triple B Brewing. Jimie and I always have a great time at these festivals and I want to give him and Jay a big shout out. A really big thanks goes out to Jimie’s nephew and my new Johnson City friend, Steven for making my day nice and bright. Knoxville was well represented by other fellow home brewers such as Legit Brewing, UBC, Friendship Brewing and Tennessee Valley Homebrewers. Other homebrew clubs such as MALT from Asheville, Tri-Cities Beer Alliance and Electric Avenue from outside Nashville were well represented and had exceptional beers. The camaraderie among home brewers is a beautiful thing. One of my favorite parts of these types of events that I set up at, is the feedback I get from people attending and trying my brews. A beer I may not think is my best may end up being the one that everyone loves the most. A perfect example this time around was my Chocolate Covered Cherry Nitro Stout. I like this beer but it’s not my favorite, and next time I brew it, I’ll make a slight recipe adjustment. However, people were going nuts over this beer! It was the 1st keg of mine to blow out and people were disappointed when it was gone. I actually won an award on this one. Gerard of the website Road Trips For Beer was a celebrity judge and he picked this one as his favorite of the festival. To say I am honored is an understatement. To have a guy who’s job is to pretty much travel the country and taste beer say he liked this one the most out of 100 something homebrews? THAT makes me feel like I DO actually know what I’m doing. I was lucky enough to have a lot of help at my booth this year in the form of my buddy Flipper who has been my right hand man at the last 3 Tri-cities beer fests. I got him all set up with the festival’s infusers and he did a terrific job of keeping them going on a schedule. 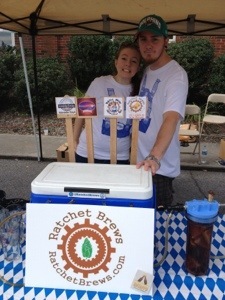 Also my assistant brewer, Todd and his wife Lauren drove up from Knoxville and helped hold things down and pour beer. With this much help, we were able to rotate in and out of the booth and walk around socializing and trying different brews. The only one missing from our crew was Richard, but he was representing for us at the Blue Ridge Wine & Food Festival. Well I went through all my home brew, drank some fantastic beer, hung out with friends new and old. The festival eventually came to a close and I packed up and headed out to eat. I found a great little place called Jack’s City Grill to eat at. After refueling, I headed back to the hotel and had an impromptu craft beer party in the lobby with Gerard. The Wolf Hill crew stopped by and hung out followed by Friendship Brewing and Aaron and Stephanie. We drank a four pack of Brevard NC brewed Deviant Dales graciously given to me by Austin, a plant employee. Gerard shared a big bottle of Boulevard’s Double Wide IPA and Friendship Brewing had a growler of their IPA. After a long active and incredibly fun day, it was time to retire to my room and pass out. I can’t wait until next year’s Thirsty Orange. Make sure to mark your calendar for Das Krew’s next event, Kingsport Oktoberfest on September 28th. You know I’ll be there. Enjoy the photos and videos below. Click on pictures to enlarge and for captions. Beer poured by her taste better! https://twitter.com/Reinkster Adam, you are a gentleman and a scholar. Great beer! Sunblock in my eyes makes me look stoned. oh, and I won an award! This entry was posted on Tuesday, April 16th, 2013 at 11:05 and is filed under #knoxbeer, Beer, Beer Festival, beer travel, Craft Beer, Drinking, home brew, home brewing, Infusion, kegs, Kingsport Oktoberfest, Knox Beer Crew, Knoxville Beer, Knoxville beer blog, Knoxville Nano Brewery, nano-brewery knoxville, Ratchet, rauchbier, starting a brewery, Studio Brew, Tennessee Beer Festival, Thirsty Orange, Tri-cities beer, Uncategorized. You can follow any responses to this entry through the RSS 2.0 feed. You can leave a response, or trackback from your own site. Please, my friend, do not insult me by implying that your charming companion influenced my votes. I strictly followed the tenets of the ethics policy established by the Association of Celebrity Beer Judges (currently headed by Charlie Sheen and one of the Kardashians) and determined that your brew was indeed the finest one I tasted that day. Had I known of the later favors that she would bestow upon me, well, I’m only human.